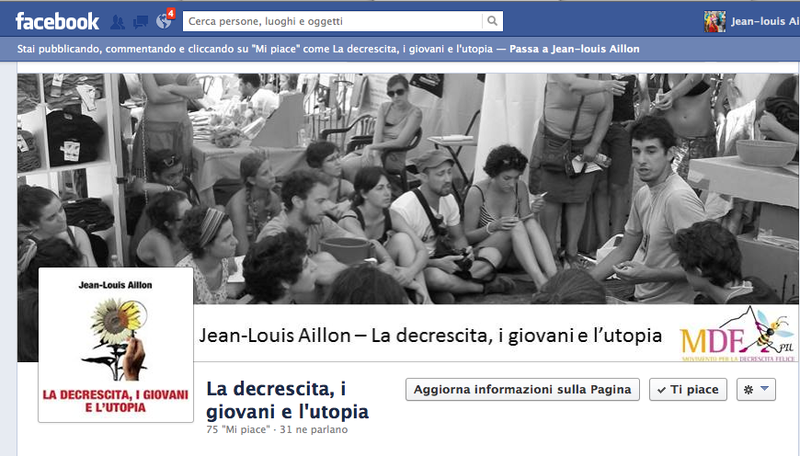 Jean -Louis Aillon, a young medical doctor and vice-president of the Movement for Happy Degrowth, published his first essay: “Degrowth, Youth and Utopia: understanding the roots of distress in order to take ownership of our future”, editions for Happy Degrowth. The book, released in September, is now available in bookstores and online (in italian). 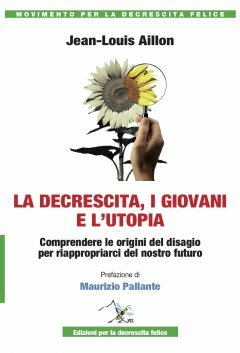 Maurizio Pallante, the founder and main theorerist of the Happy Degrowth in Italy, called it a debut work in which the degrowth is analyzed from the original and challenging point of view of a twenty-nine young doctor, specializing in psychotherapy and decided to put his skills at the service of an ideal, not a career. Jean-Louis Aillon’s essay represents, in fact, the first attempt to conduct a deep analysis of psycho, social and cultural discomfort of the younger generations, scrutinizing this world through the lens of the degrowth theory. The analysis, however, is not limited to the mere description of reality, but attempts to outline new possible horizons where the concept of utopia can resume its critical role in driving biological evolution and thus preventing the massive crisis that otherwise may bring the system to collapse in the near future. Back cover: Being young, today, is a titanic challenge. Teenagers finds themselves alone dealing with the meaning of life and a world that is falling apart, in a scenario in which the future of the “promised land” has become a threat. Uprooted from their past but without the ability to project themselves in any future, left without guides, it is almost impossible for youngsters to find their own way and they end up groping in the dark of an eternal present, easy prey for the market and its mirages. How to get out of this impasse? 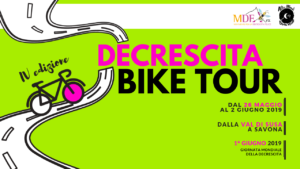 A feasible trail is traced by the degrowth movement. Young people, however, turn a deaf ear to our calls. Degrowth thinkers have, indeed, focused mostly on the analysis of the adults’ reality but, although the causes of the problems are similar, the world of youth is, however, completely different. Therefore, the path to delineate has to be different. This is the question Jean-Louis Aillon attempts to address in this essay, through a careful analysis of the cultural and psycho-social distress, trying to scrutinize the universe of youth through the lens of degrowth, looking for alternative horizons. If we have the tools and courage to face the reality, the latter transforms itself. “Our” crisis thus becomes an opportunity to understand ourselves and the world we face. We, therefore, take ownership of the reins of our future, we return protagonists and … utopia can become reality.